It is Ash Wednesday and for all of you who celebrate the Christian faith, I wish you a day filled with reflection. During the journey of Lent, I hope you find peace in your prayer and penitence as we look to renew our lives with God’s grace. Last weekend, my son’s school had a fund-raiser that was really fun. As a small Catholic school, these fund-raisers are critical to get needed books and up-to-date teaching supplies. The community members of Warrenton were incredibly generous and offered raffle items for the event. If you live in or near Fauquier County, please remember to tell Iron Bridge Wine Company, Hartman Jewelers and Old Town Athletic Center that their contributions are truly appreciated! As a small thank you to them, I made some cards for the school to send. We all know the power of a hand-made, hand-written note and I hope that these will show our gratitude. 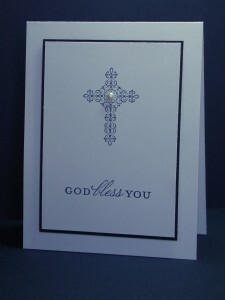 I think the beauty of the card lies in the Clean and Simple style. 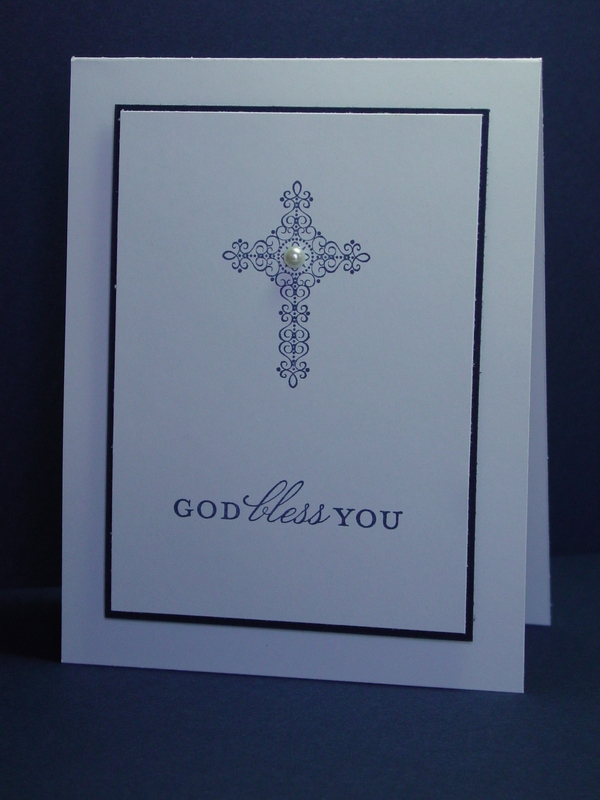 I love the crosses in my Crosses of Hope set and the sentiment says it all. I stamped in Night of Navy and added a Night of Navy border. A large pearl from the Basic Pearls is the finishing touch. The event coordinator wanted to hand write her thanks and I think the sponsors will greatly appreciate her efforts! Thanks for stopping in today. I’ll be back tomorrow with another ColorLab Challenge. I hope that your Lenten sacrifices come back to you as rich blessings and that the true Cross of Hope strengthens you every day. What an elegant card. The pearl in the middle is a gorgeous touch! Clean and simple works well here! Just lovely! Funny story- I could have sworn I ordered this set in August and I seem to remember mounting it. But I couldn’t find it this spring, so I ended up ordering it recently. Now we all know I will find the first one any day now, lol! Beautiful card! I’ve been looking at this set. We don’t celebrate Lent in a traditional fashion, although I am enjoying explaining all the traditions to my daughter. We definitely look forward to the countdown to Easter! I asked her what she would give up. She said swimming (she doesn’t have swimming class at this time – big stretch!). Then, what should Mama give up? My TV shows. Wait a minute! Haha. May you be blessed this season as well! So beautiful. Both the card and the blog post. It’s a lovely card Jen. And God bless you and your family during this Lenten season. Love the simplicity of the card!! Excellent!! What a lovely, lovely card, Jen. The simplicity reinforces the message–perfect for Ash Wednesday. Peace be with you and your famly this Lenten season.